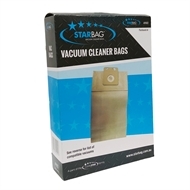 Starbag offers a range of vacuum bags for vacuums of all shapes, sizes and ages, including the ALTO and NILFISK range. Suitable for ALTO SALTIX 10, NILFISK GD910, GD911, GD1000, GD1005, GD1010, GDS1010, GD2000, GD111, HDS1005, HDS2000, GDP2000, VP300, VC300 and VP600 vacuums. These double-glued paper dust bags are the most common for domestic vacuums.